TORINO, Italy — HARMAN’s Soundcraft and Studer’s Italian distributor, Leading Technologies Srl, along with sister company Sound Light & Technologies (SL&T) recently participated in an exciting recording project with RAI Radio, using a combination of Soundcraft and Studer digital mixing platforms in order to optimize the sound. The vast production of Rossini’s famous La Cenerentola (Cinderella), which involved around 250 members of cast and technical crew, was mixed on a combination of three Studer Vista 9 and Vista 5 consoles, with three further Soundcraft V1 desks providing backup. These were used in four different scene locations: while the actors, singers and choir were variously located in Parco della Mandria in Venaria, Palazzina di Caccia and Palazzo Reale in Torino, the orchestra was recorded remotely at the Auditorium RAI in Torino. All locations were linked by fibre or radio bridge to give the actors the sense of performing in real time with the orchestra—and a Studer stagebox was positioned in each venue. On duty were two Vista 9 consoles (configured with 52 faders), a further Vista 9 with 42 faders and a 42-fader Vista 5 located in the OB truck, which were used for mixing the Orchestra and actors’ microphones, as well as for 5.1 post-production, while the three Soundcraft Vi1 consoles were used for pre-mix of secondary inputs and backup. A multitrack recorder received the audio via a MADI port on the Vista 9. The orchestra required 68 microphone channels on the desks with a further 12 channels for the choir (who were based in the same location as the actors). RAI Radio provided technical staff while SL&T provided personnel support and other ancillary equipment from the HARMAN Professional portfolio, such as JBL EON loudspeakers and AKG microphones and headphones. AKG C414 XLII and various K141 and K702 microphones were used for mixing and monitoring by the musicians and engineers. 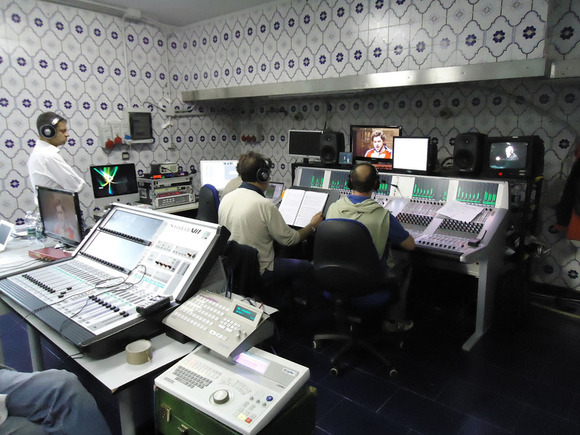 The La Cenerentola recording marked the latest success in a long relationship between Italy’s national broadcaster and SL&T/Leading Technologies. The event itself was transmitted live around the world over a 2-day period in early June and the DVD, produced by Rada Film, will be available soon for marketing and promotion. RAI Radio has the technical production rights for La Cenerentola, with Antonio Ciano taking overall audio responsibility, Fiervisaggio Giorgetti, technical project and installation supervisor, Marco Diodato and Domenico Narducci as Vista 9 engineers and Dario Chiapino as Vista 5 engineer. Rada Film has the production rights for Cinderella under the authorisation of Andrea Andermann with the direction of Carlo Verdone. Providing the technical interface between Rada Film and RAI was Alessandro Bernardi.